Taking Fairlawn Smiles from Dull to Dazzling! Smile Makeovers! You hear about them all the time and now you can have one of your very own, right here in Akron, Ohio! And while that is terrific news for anyone who doesn’t feel confident about his or her smile, it is also great news for those whose smiles aren’t as healthy as they could be. A healthy smile is a beautiful smile. That is the philosophy at the very heart of our dental practice. That means that when you have a smile makeover from Dr. Bryan Stephens, you aren’t just having a cosmetic procedure. 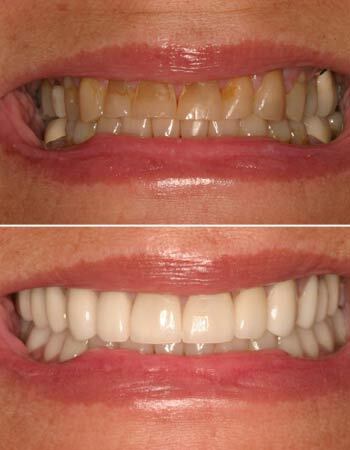 Our smile makeovers are designed to bring teeth back to their original function, balance and, yes, beauty. Every new smile makeover from Dr. Bryan Stephens starts with a comprehensive exam from which we will build your unique treatment plan. Together, you and Dr. Stephens will discover where your smile is as far as health and strength. Once a baseline of health has been established, you can start planning your journey toward a beautiful smile. A smile makeover should be completed at your pace – some people like to have everything done at once, while others prefer to take their makeover a bit more slowly, pacing out their procedures until they have the smile of their dreams. Because every smile makeover is unique and tailored to fit your particular needs, there is no formula for a smile makeover. A smile makeover could involve anything from simple measures like whitening, tooth recontouring and bonding, to more advanced procedures such as multiple crowns, implants and Invisalign clear braces. Whatever your smile needs are, we can help bring your smile back to the kind of health and beauty nature intended. Check out our smile gallery – you’ll see what we mean! I had my usual “pre dental visit angst”, but the entire procedure (crown) was painless, easy- and a change to catch up on my reading while I waited. Thanks for explaining what was going to happen as we went along.